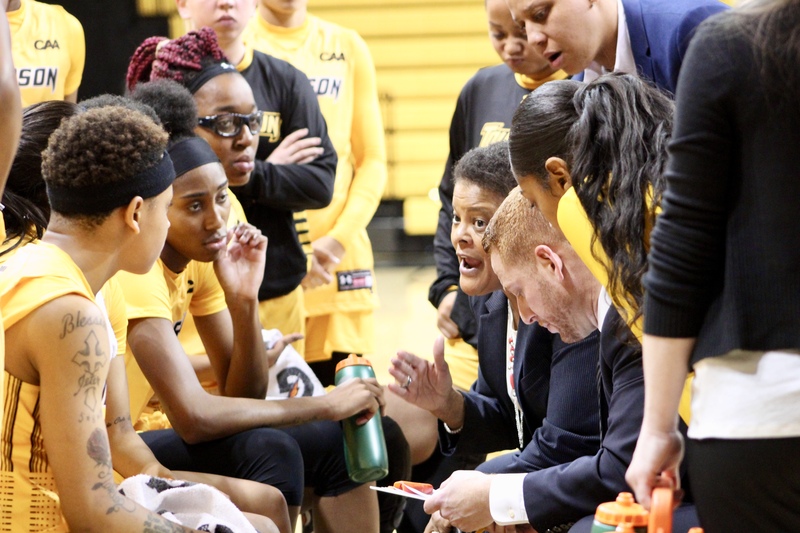 Towson University’s Women’s basketball team is currently on a five-game winning streak while making history in the process. On Jan. 4, the Tigers squared off against Drexel University to kick off the new year and Colonial Athletic Association (CAA) conference play. Despite trailing by 11 at halftime, Towson clawed their way back into the game to defeat the defending regular season CAA champions. Junior Nukiya Mayo sealed the 55-54 victory with an athletic running floater at the final buzzer to give Towson their first win over Drexel since 2010. Redshirt sophomore Kionna Jeter led the Tigers in scoring with 21 points while Mayo recorded 13 points and eight rebounds along with the game winning shot.
.@ncaawbb have you seen this play from @Towson_WBB as Nukiya Mayo floats home the game-winner to snap a 19-game drought against Drexel? 48 hours later, Towson faced off against the University of Delaware on the road for the fifth consecutive game. Kionna Jeter led the way in scoring once again with 24 points as the Tigers earn their second straight conference win. This victory marks the first time since the 2013-14 season that Towson has started conference play 2-0 and also secured the first win at Delaware since 2008. Head Coach Diane Richardson gets her first win over the border rival. Nukiya Mayo tallied 13 points for a second straight game while Maia Lee led the team in rebounds with 11. Towson as a team set a new season high with 62 rebounds, previously 51 in November. On Friday, Jan. 11 Towson took the floor against Northeastern in a battle for first place in the conference. Nukiya Mayo put on a career performance with 30 points, 9 rebounds, 5 steals, and 5 blocks leading the Tigers to the 88-83 victory. She set new career-high totals in points, steals, and blocks. Mayo certainly was not the only one to put on a show. Qierra Murray finished with 21 points and Kionna Jeter also put up 20 points. The trio combined for 71 of the Tigers 88 total points. Two days later, even a snowy Sunday afternoon could not slow down the Towson University women’s basketball team. The Tigers hosted their second home CAA game of the year and defeated Hofstra 92-68 in a lopsided win. The Tigers were led by Kionna Jeter who scored 29 points and recorded a season-high seven steals. Nukiya Mayo recorded her second double-double of the season with 11 points and 11 rebounds. Senior Maia Lee grabbed a career-high 14 rebounds to lead the team. Despite incorporating eight new players into the program, Towson (10-5) is off to a good start as they have already surpassed the number of wins from last season’s team that finished 9-21. The Tigers are currently tied for first place in the CAA (4-0) with James Madison and have put people on notice after the team was predicted to finished eighth out 10 in the CAA conference preseason poll. Towson will return to action tonight Jan. 18, traveling to compete against the College of Charleston in South Carolina at 6:30pm.